Published by the American Bar Association (ABA), The Cold War: Law, Lawyers, Spies and Crises discusses the roles and impacts of lawyers and the law during the Cold War. In the pre-dawn hours of Sunday, August 13th, 1961, East German police and military deployed along the Soviet Sector border, and workers set up barricades; soon, they began to construct a cement-block wall. Running right down the center of the city, from north to south, a concrete wall rose almost overnight. The Berlin Wall was almost twelve feet tall, capped by barbed wire. On the East Berlin, Soviet Sector side, there was a death strip of carefully raked sand with concealed flares that released if anyone stepped on them. This strip provided the East German soldiers with clear visuals from their armed guard towers to capture or shoot anyone trying to flee from the East into the West. Between 1961 and 1989, some 287 people were killed at the Wall. The twentieth century was drenched in the blood of two World Wars. In that context, the Cold War was relatively benign, more a broad ideological conflict than a traditional clash of nation-states. However, during the four decades of the Cold War, there were periods of intense crisis, when – almost by accident – the world was spared nuclear war. The important actors were the politico-military strategists who wielded immense international power. Their plans and positions were developed with the help of lawyers and new and uniquely applied laws. International organizations, treaties, and multinational defense structures sprung from the ideas and labor of lawyers. The Cold War: Law, Lawyers, Spies and Crises is a thorough look at the people and doctrines that helped avoid global catastrophe. 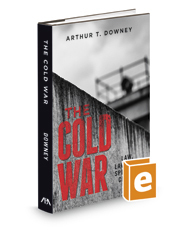 From the Cuban Missile Crisis to East German uprisings, McCarthyism to loyalty oaths, The Cold War is the singular story of an uncommon time in world history.